Please join FAR for Research Night on April 11th at 7pm. 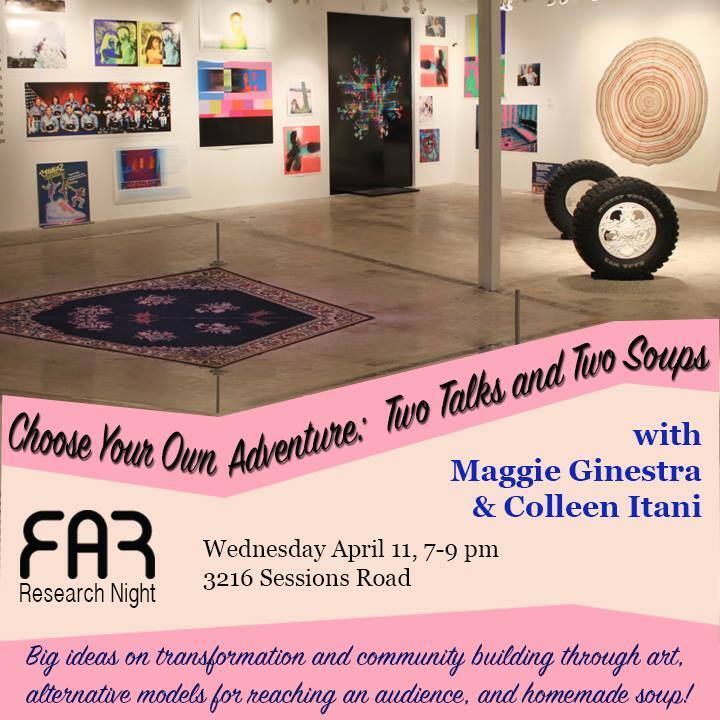 Choose your Own Adventure: Two Talks and Two Soups will feature talks from FSU Alum Maggie Ginestra and FSU MFA student Colleen Itani. Ginestra will reflect about through-lines in her curatorial and making practices that have ferried her to this moment: negotiations with transformation, ritual, community, capitalism, and language. *spoiler alert* She’s now a full-time acupuncture student. Colleen Itani will speak about the unfolding of Tally Zine Fest, from idea through realization. The first Tally Zine Fest took place in February 2018 with the goal of fostering an inclusive space for artists to provide self-published zines to the broader Tallahassee community. She will reflect on the successes and challenges of this event. The talks will be followed by a soup dinner prepared by Maggie and Colleen and accompanied by free writing and guided conversation facilitated by the presenters.